It may not feel like fall, but fall migration is upon us. 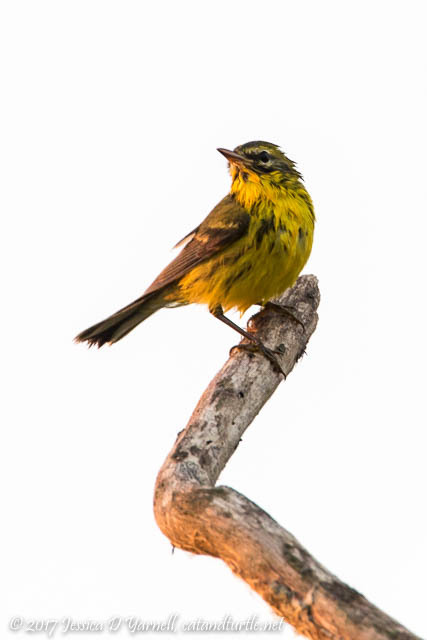 It seems like yesterday that we celebrated the arrival of the spring migrants at Fort De Soto. Now we say goodbye to those birds as they head south for winter. 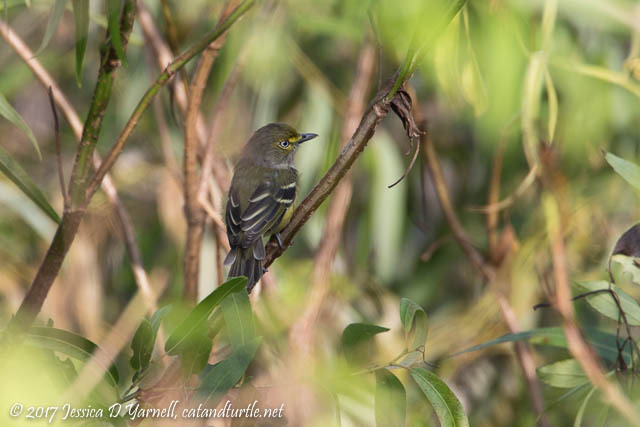 I headed to the Lake Apopka Wildlife Drive on Monday to chase some warblers and wish them well on their journey. It’s been a few weeks since I visited LAWD. It was quiet. Very quiet. I was at the gate at sunrise, like usual, but I didn’t hear the Blue Grosbeak and I didn’t hear any Red-winged Blackbirds. 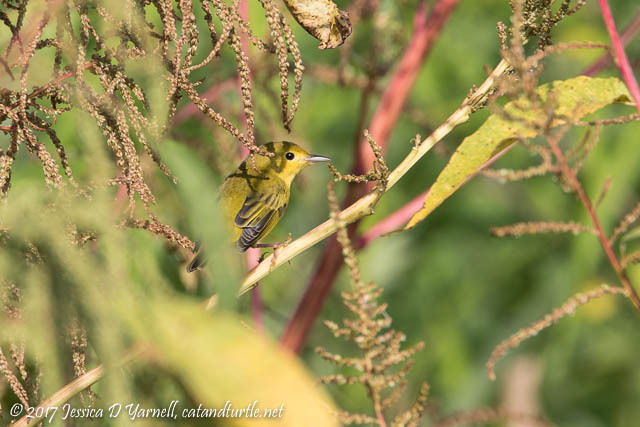 Before I had gotten far on Lust Road, though, I had my first migrant of the morning: an adult Prairie Warbler, whose dark stripes hadn’t faded too much (yet). On Welland Road, I saw my first of several Belted Kingfishers. She was perching in a clump of dead branches, eying the pond beneath her. Occasionally she would fly out, grab a fish from the water, and bring it back to her perch to eat. You know she’s a “she” because of the rusty patches on her tummy. She flapped her wings as she returned to her perch and she made me think she was practicing to lead an orchestra! 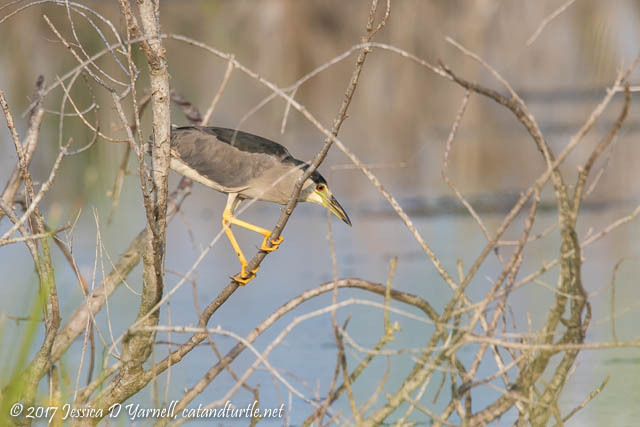 Not far from the kingfisher, an adult Black-crowned Night Heron was also stalking his breakfast. He stood motionless in the dead branches, watching and waiting. No doubt he also found a fish in the pond. Laughlin Road turned out to be my favorite stretch of the morning. I often think of it as the “surprise” stretch – you never know what bird may hop up on the vegetation outside your window! 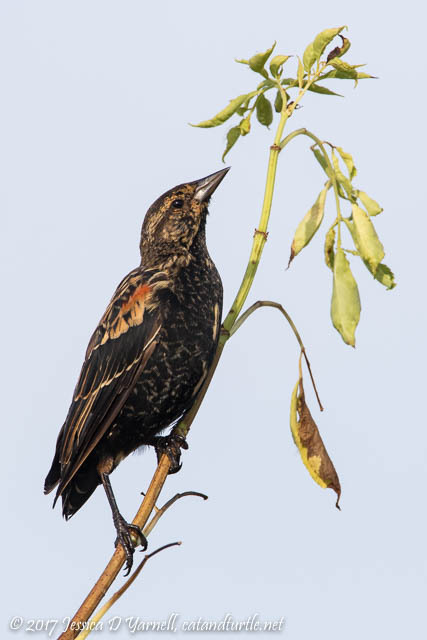 In the early summer, the Red-winged Blackbirds stand guard over their nests. Now that the fledglings have gone, I saw significantly fewer blackbirds. But a couple of juveniles remained, showing off their molting plumage, a mixture of juvenal brown-and-white with a hint of black and red stripe. The high vegetation is dying back, and the water levels are the highest I’ve seen along Laughlin. The combination gave me the eery impression that I had shrunk. 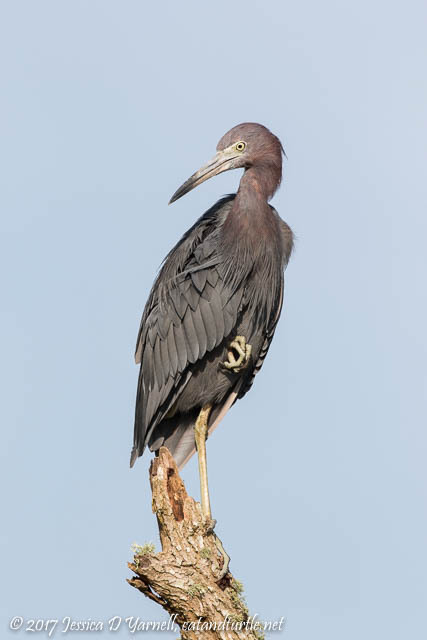 It also yielded better views of the perched birds, like this Little Blue Heron. 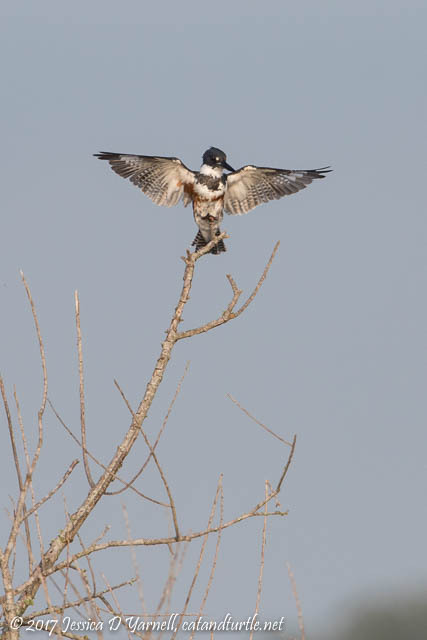 He stood on one leg as he preened, with his other foot sticking out in front of him. Birds always impress me with their good balance! Laughlin turned out to be the “right place at the right time” for migrants. I heard a small chipping call and spotted a Yellow Warbler, the first of three that I saw that morning. He played peek-a-boo with me through the leaves. 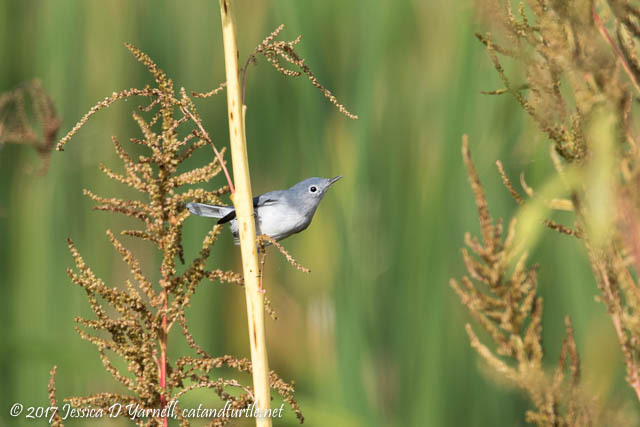 Next I heard the wheezy call of a Blue-gray Gnatcatcher and found several darting in and out of the vegetation. The same bushes that the swallows posed on during my last visit are covered in seeds and bugs, perfect for tiny gnatcatchers. These small birds can hover to eat and almost give the impression that they are hummingbirds. 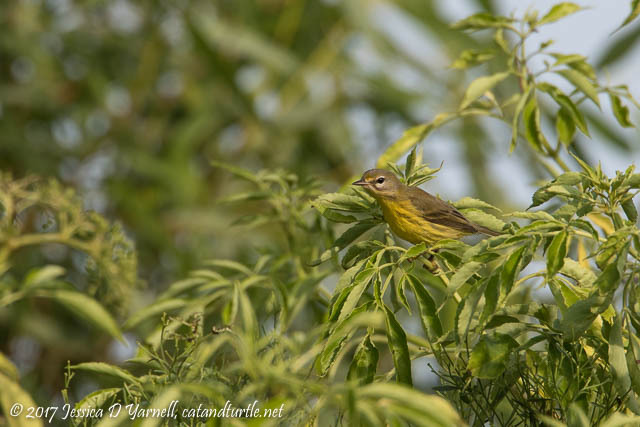 I spotted a few more Prairie Warblers, including this juvenile bird. The juvie doesn’t have the pronounced black lines of the adult, and the juvie sports a white patch around his eye. He hopped out to the top of a bush for just a second, then disappeared. When I made it to Interceptor Road and saw the pond there, I was amazed. The vegetation is dying back and it was a sea of brown. 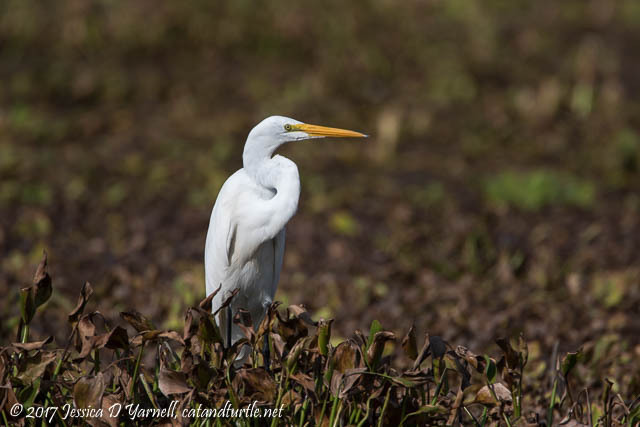 Dozens of white wading birds congregated there. Periodically one would fly over the pond, drag his feet in the water, and pull out a fish. One closer to me just stared at me, daring me to take this photo that so strongly suggests the start of fall. Thank you for sharing your drive again! Superb photographs! Sadly, looks like it may be awhile before any of us will be able to return. Hopefully, the cleanup won’t take too long, but there are certainly many who need immediate help. We hope you weathered the storm okay. Have you seen the photos of the wildlife drive? Parts of Lust are still under water. We’ll see which comes sooner: cooler temperatures or the re-opening!